Det. 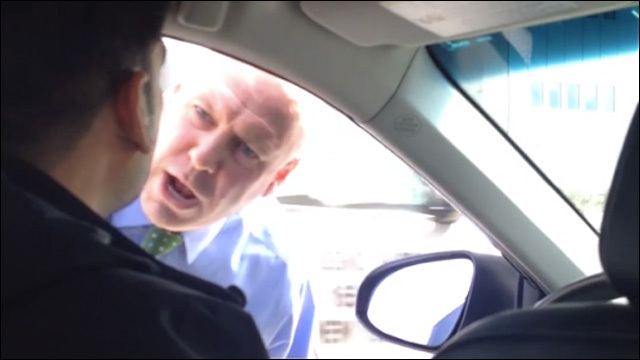 Patrick Cherry was caught on camera screaming a xenophobic rant at an Uber driver. A New York police detective is under official investigation after getting caught on camera going off on a rage-filled, profanity-laced, xenophobic tirade towards an Uber driver during a traffic stop. The New York City Police Department's Internal Affairs Bureau says it's reviewing the video, which shows Patrick Cherry, a detective assigned to the FBI's Joint Terrorism Task Force, yelling at the driver (identified as "Humayun") and repeatedly mocking his accent and pronunciation of English. Cherry can be heard shouting during the encounter, "I don't know where you're coming from, where you think you're appropriate in doing that; that's not the way it works. How long have you been in this country?" According to the video description, the altercation was set off when Cherry allegedly tried to park his car without using his blinker at a green light, and the Uber driver went around him, gesturing to him to use his signal. That's when Cherry pulled him over and went off. Police abuse of Uber driver in New York City. In an unmarked car, the policeman was allegedly attempting to park without using his blinker at a green light. (His reverse lights weren't on. Likely double parked without hazards on.) The Uber driver pulled around and gestured that he should use his blinker, casually and non-offensively, and kept driving us. The policeman quickly pulls up behind us and this is what happens. This occurred just before 2pm on the West side of Manhattan, in NYPD 6th Precinct, on March 30th, 2015, near Little West 12th Street. The officer did not identify himself, but he had a New York license plate: GSS 8891. Power trippin' yo. Police Commissioner William Bratton issued an apology to the Uber driver and passengers, and said the detective has been placed on modified assignment pending an investigation.